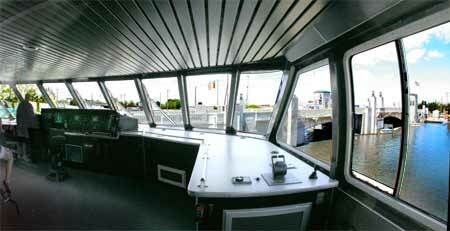 Jet Express provides a state-of-the-art, modern designed catamaran, offering the smoothest, fastest ride across Lake Erie. Choose from comfortable, all-weather protected, indoor seating or a thrilling open air ride on the sun decks. 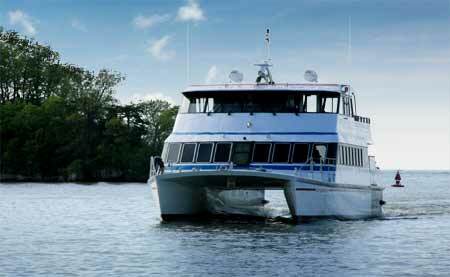 Jet Express started service in 1988 by 4 partners with an idea to create an innovative ferry service to Put-in-Bay harbor. Traveling up to 40 mph, Jet Express offers a 12 1/2 mile scenic tour. On your way, you'll pass 7 Lake Erie Islands and many unique points of interest. A knowledgeable crew is on hand to answer questions and provide service, shore-to-shore from downtown Port Clinton and Sandusky, to downtown Put-in-Bay, and Kelleys Island (Kelley's Island service departs only from the Sandusky Port). Jet Express is a people mover only, meaning no vehicles. You'll have to pay to park before getting on board. The ride is indeed fast, but if the wind is up, expect a bumpy ride. 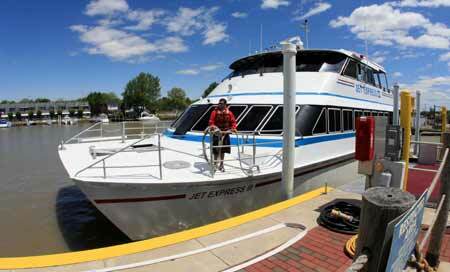 The catamaran design of the Jet Express boats provides the fastest ride across Lake Erie to South Bass Island. The Jet Express is Handicap Accessible.